Good afternoon, space fans! It's been an exciting week for entering orbit! Driving stick-shift in a spacecraft? No problem for Expedition 46! Last Tuesday, a Soyuz spacecraft bore the three new ISS crewmembers to their new six-month home. NASA astronaut Tim Kopra, ESA astronaut Tim Peake, and cosmonaut Yuri Malenchenko launched from the Baikonur cosmodrome in Kazahkstan and arrived later that day on the station. It is Kopra's second mission to the ISS, the first for Peake, and the sixth for Malanchenko, which ties him for the Russian spaceflight record to the ISS. Six trips to the space station, but never a dull moment. The launch and flight were a smooth one, despite the fact that manual control of the spacecraft had to be taken for docking. This was handed without interference by Malenchenko, the module's pilot. Malanchenko, center, remained chill about the manual override. Like this six-time spaceman gets flustered about having to do some driving! Peake's sojourn on Expedition 46 is a historical one, as he is the first British ESA astronaut to visit the station. He has been congratulated by famous Britons from the Queen to Paul McCartney (no word on whether Keith Richards sent congrats, as he's already been spaced out for decades and considers it easy by now.) You can follow Peake's adventures more closely via his Twitter, @Astro_TimPeake. Astronaut Kopra will also be tweeting his time in space, and can be followed @Astro_Tim. Peake bids a temporary farewell to his son on Tuesday. The astronauts began transferring cargo, conducting experiments, and generally familiarizing themselves with the ISS. No slacking on the space science! Peake also began a fun "experiment" where he tweets lyrics of what he is currently listening to, allowing astro-fans at home to enjoy his space soundtrack. You can follow his orbital DJing at #spacerocks. 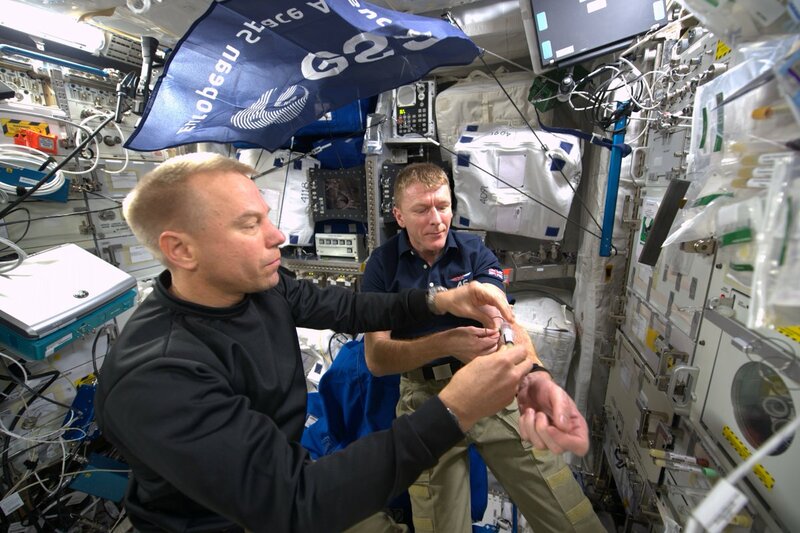 If you hate having blood drawn on Earth, just think about the skill it takes in microgravity. Thanks for the donation to science, gents! 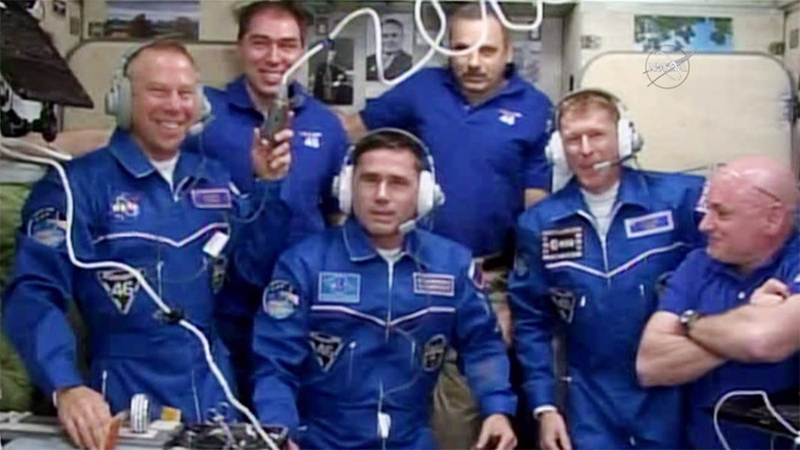 More information on the Expedition 46 crew and their work is available here. Experiments including radiation studies, analysis of the station's microbiome, and more will be conducted. Yesterday, the Progress 60 module undocked from the Pirs compartment of the ISS, bound for a burn-up reentry through the Earth's atmosphere. The module, which is filled with trash from the station, is being released not only to incinerate the trash, but to make room for a new module arriving next week. The new arrival, Progress 62, is another resupply ship that will be docked to the Pirs compartment. The launch will occur tomorrow afternoon, with the Progress 62 slated to arrive at the station on Wednesday. After the Progress 62's launch, NASA astronaut (and current Expedition 46 commander) Scott Kelly and newly-arrived flight engineer Tim Kopra will conduct a spacewalk to ensure the station's mobile transporter is locked in place to ensure safe arrival of the spacecraft. NASA TV will cover the spacewalk starting tomorrow morning at 06:30 EST, with the actual space stride occurring around 08:10. The spacewalk was previously unplanned, but necessary to fix a stuck brake handle that has left the mobile transporter a mere four inches from where it needs to be functioning. This will be the third spacewalk for Kelly, the second for Kopra, and the 191st for station maintenance overall. Kelly spent the last few days doing emergency training for the spacewalk (a.k.a EVA, or extravehicular activity), but he also managed to capture some of his excellent "Earth Art" from the orbital outpost. Mountains take on a magical look from the ISS. That's about it for this week, space fans! We'll see you next Sunday with more on the spacewalk, the new cargo craft, and all the adaptations Expedition 46 are getting accustomed to. Watch this space! Three men and a 27 million horsepower, 40-meter- tall rocket. The Expedition 46 Soyuz awaited its launch on Tuesday. 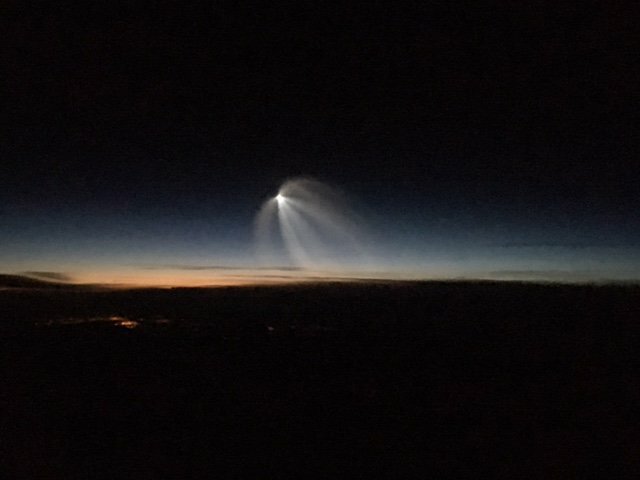 The Soyuz, as spotted by an airline pilot over Frankfurt. Watch the whole launch, courtesy of NASA TV!